I belong to the First Edition Facebook group, a book discussion conclave sponsored by the Sunday Times of London and moderated by reviewer James Marriott. It’s a lively, informal, and opinionated bunch, with myself far from the least opinionated, of course. It is here that I developed my defense and praise of My Brilliant Friend and The Story of a New Name, the two volumes I have read so far. Someone immediately commented that they thought it overwritten–someone who later stated that, well, they hadn’t read the book yet. Said commenter was half-right: it is overwritten–and that is why it’s perfect in its context. In context it perfectly expresses the artificial nature of the relationships of the several characters populating that chapter, where all of them, quite young (by US standards) are posing for each other and themselves, trying to find where they fit in with each other and the adult world, trying to impress each other. Its desperate, poetic pretension is just right for the passage in which I encountered it. Functionally, the phrase embodies a recursion, being itself portentous and somewhat trite, and reveals a great deal about the narrator at that point in the story. The entire two volumes that I know so far are like that: thanks not only to Ferrante but to the strength and grace of translator Ann Goldstein’s work, the structure as well as the meaning of each line exposes the themes and feelings that define the characters. I am looking forward to reading the next two books soon. This long story is about conflict, reconciliation, regeneration, and, of course, failure and success. And the bitterness of being female in a harsh, very harsh, patriarchal culture. Lenu and Lila are, respectively, the narrator and her best friend; their closeness comes and goes, and class issues play into their occasional separations, especially as Lenu goes through high school and college while Lila marries young and badly. Lenu’s family is even poorer than Lila’s, but Lenu, with a plodding discipline that makes her more or less disappear when she’s near the fiery Lila, carries herself out of that world, leaving Lila behind. It’s a story full of subtleties and complex undercurrents. The characters ring true; I have known folks like the two protagonists, at least. Such contexts exist here in the US as well; see Annie Proulx’s “The Wamsutter Wolf,” and any number of coming-of-age-in-the-slums stories. The tale is harsh, but nowhere near as harsh as, say, the novels of Emile Zola that I have read so far. Furthermore, Ferrante manages the difficult trick of telling a long and complex story only through the point of view of the first-person narrator, who is often dependent on hearsay, after-the-fact confessions, and, in one case, her friend’s journals for information about events that took place without her–journals given to her for safekeeping with an admonition not to read them, and which she reads and then throws into the river, as they upset her so. I found it difficult to stop reading at night, when I needed to go to bed, or before dinner, no matter how hungry I might have been. The telling of the story is structurally flawless, powerful, and replete with passion, uncertainty, and love. Ferrante has created a masterpiece–there is no other word that is true enough but that one. Be brave and read this profund and violent story. It will take you out of yourself, and bring you back transformed. Addendum, 20 January 2019: I have now finished the entire series, and wish to re-confirm everything I’ve said above. Intense, compassionate, and cruel, brutally honest and poetic, this is a great wild beast of a tale, a tiger, a leopard, anything beautiful and terrifying, impossible not to admire nor to fear…. 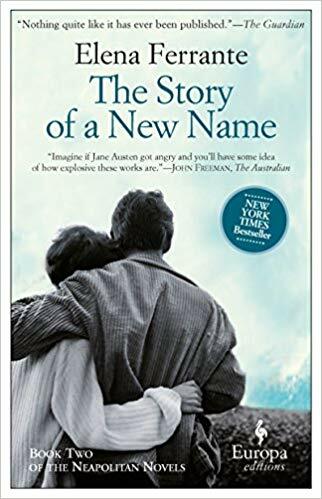 Take genetic material from Ulysses and The Remains of the Day, splice it into Les Misérables, and you have the beginnings of this intimate and magisterial work, one of the great achievements of literature. I am truly sorry I read it–because now I can no longer look forward to encountering it for the first time, and entering into Ferrante’s intricate world of desperation, struggle, and loss, of discipline and endurance, and ultimately, of the fundamental necessity of love.